Ethanol fireplaces do produce heat, but it is a gentle heat. It is important to get the right size ethanol fire to heat the space. Otherwise you will be disappointed with the outcome. At Instinct Bio Fires we use our standard fire box in most of our ethanol fire free standing designs or our wall mounted units. The standard unit is the 1.5 Litre, this unit produce 1.6kW of heat an hour. Burns for 5.5hours on 1.5 Litres you can adjust the flame size and increase the burn time. The running cost is about $4 to $4.50 for an evening’s heating 6pm to 11pm. 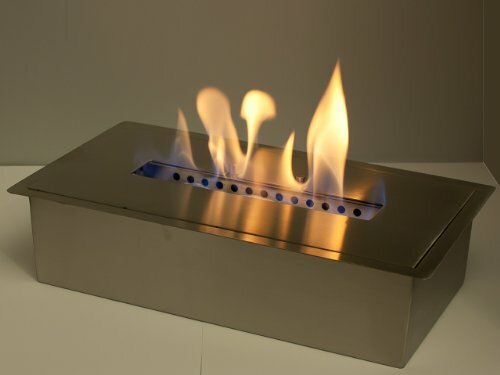 This burner box can heat on average 20m2, a room 4meters X 5meters. When heating larger areas, consider using a few small wall and floor units to spread the heat around.